THE STORY - Jordan is a take-no-prisoners tech mogul who torments her long-suffering assistant, April, and the rest of her employees on a daily basis. She soon faces an unexpected threat to her personal life and career when she magically transforms into a 13-year-old version of herself right before a do-or-die presentation. Jordan will now need to rely on April more than ever -- if April is willing to stop treating Jordan like a 13-year-old child who has an attitude problem. THE GOOD - It’s very funny. 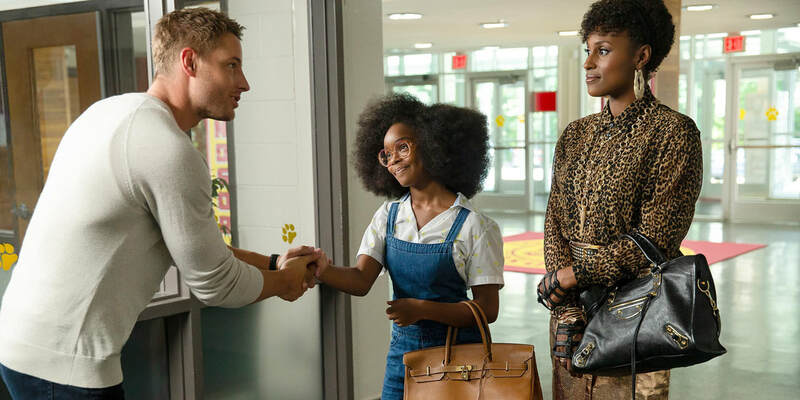 Issa Rae has tremendous chemistry with Regina Hall and Marsai Martin, who is an absolute STAR. ​​​​​​There is pleasure to be found in the predictable. Everyone likes going home and having your parents or grandparents cook your favorite meal. It’s more or less the same every time, and no matter how many times you’ve eaten it, or how many more sophisticated things you’ve eaten, you still enjoy it. So there are plenty of reasons to enjoy “Little”, the newest spin on the age-old story of a protagonist who gets magically turned into a younger (or older) version of themselves in order to learn an important life lesson. “Big”, “13 Going on 30”, and “17 Again” are just a few examples of this formula, and Tina Gordon Chism’s new film fits in snugly alongside them as a variation on this tried and tested Hollywood formula. We are first introduced to Jordan Sanders as a middle school nerd (Marsai Martin), who is excited to get in front of her whole school at a talent show and share her love of science. But when a bully turns the tables and embarrasses her, she vows to grow up to become a boss, so no one else will bully her… because she will bully them first. And so it comes to pass: Grown-up Jordan (Regina Hall) is a tech mogul living a glamorous life in Atlanta. She’s a tyrant in the office, to the point where her workers will scuttle away an entire birthday celebration in seconds as soon as she walks through the door (carbs are verboten at JSI). Her long-suffering assistant April (Issa Rae) can barely put up with her but does in the hopes that one day Jordan will see her talent and promote her to the creative team. But the next day - after a little girl wishes Jordan was little too, so she could give her a taste of her own medicine - Jordan wakes up to find herself back in her middle school body. Naturally, April is the only one she can turn to for help. Add in a requirement from Child Protective Services that young Jordan should be enrolled in school and a deadline for a pitch to keep JSI from losing its biggest client, and you have all the elements of a classic body switch comedy. The PR line on “Little” is that the idea was none other than Marsai Martin’s and that she came up with it when she was only ten years old, inspired by her mother’s favorite movie, “Big”. She’s also the executive producer of the film, one of the youngest people to ever assume that title. Her teenage spirit runs throughout the film, which has energy and optimism to spare. It’s also present in the film’s ultimate message: Be true to yourself, and kind to others and people will follow you wherever you lead them. Martin also proves to be a huge star as the younger Jordan, with charisma to burn and tremendous talent. She is utterly believable as a grown woman trapped in a child’s body, which is key to selling the film. She’s helped of course by Regina Hall, who sets up Jordan’s character and is clearly relishing the chance to play a big, broadly comic horrible boss. While it’s true that no HR department would ever let Jordan’s physical and emotional abuse stand, Hall gives just enough of a comic spin to her actions to make the audience laugh at Jordan’s brazenness, and just enough vulnerability to let the audience know that deep down, Jordan is still that bespectacled, insecure middle schooler. Comedies live or die by the humor of the script and the performers, and on that front, “Little” delivers. The audience I was with ate up every last joke, especially those delivered by Issa Rae, who has fantastic comic timing. Like all the best comedic actors, there is something about her delivery that is uniquely hers, putting a spin on lines that coming from someone else would be groan-worthy. The whole cast seems to be having a great time, and that good feeling is infectious, especially as it pertains to the three outcast kids Jordan meets at school who help teach her the lesson she must learn to become her older self again. All this is great, but its adherence to formula keeps “Little” from reaching true greatness. Nothing that happens is surprising or subversive in any way, and it looks like every other big-studio comedy - glossy, with an over-reliance on medium close-up, shot-reverse-shot technique. The whole thing feels like one of those connect-the-dots activities we used to do when we were kids. But those were fun when we were kids, and “Little” is partially about remembering how life felt when you were a kid. And besides, the crayons the film uses to color in that connect-the-dots shape are bright, eye-catching, and fun to look at. And that’s more than many modern-day big-studio comedies can say.